Stoft is a creative design studio in Malmö. Our designs are produced in unique one-offs, limited editions or in larger batches, by ourselves or in collaboration with skilled craftsmen. 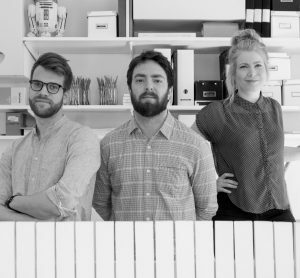 Stoft was founded in 2013 by Jenny Ekdahl, Joel Herslow and Ola Nystedt. We were drawn together by a common fascination for how things move, sound and feel. Our work builds on our different but complementary approaches that helps us in designing objects to be discovered with all our senses. Stoft’s products in our shop. Read more about Stoft at their website.